World leader in sandcarving solutions. (800) 643-1037 23 Art Supplies Art Supplies Fully appreciating the process-rich nature of any sandcarving operation, IKONICS Imaging has been hailed as the Total Solutions Supplier longer than any other suppliers serving the industry have been in business. This history has allowed IKONICS Imaging to concentrate on manufacturing "support products" that are every bit as critical to the sandcarving process as equipment, photoresists, training and education. 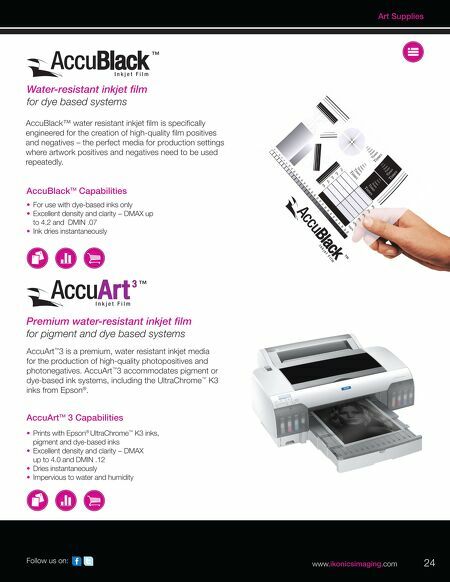 The AccuArt TM line of water-resistant, ink-jetable photopositive films, created by the IKONICS Corporation in 2001, is the industry standard. 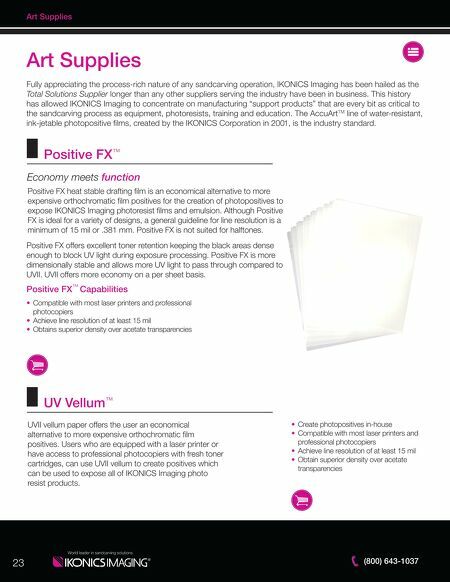 Positive FX ™ Capabilities Positive FX ™ UV Vellum ™ Positive FX heat stable drafting film is an economical alternative to more expensive orthochromatic film positives for the creation of photopositives to expose IKONICS Imaging photoresist films and emulsion. Although Positive FX is ideal for a variety of designs, a general guideline for line resolution is a minimum of 15 mil or .381 mm. Positive FX is not suited for halftones. UVII vellum paper offers the user an economical alternative to more expensive orthochromatic film positives. Users who are equipped with a laser printer or have access to professional photocopiers with fresh toner cartridges, can use UVII vellum to create positives which can be used to expose all of IKONICS Imaging photo resist products. • Compatible with most laser printers and professional photocopiers • Achieve line resolution of at least 15 mil • Obtains superior density over acetate transparencies • Create photopositives in-house • Compatible with most laser printers and professional photocopiers • Achieve line resolution of at least 15 mil • Obtain superior density over acetate transparencies Economy meets function Positive FX offers excellent toner retention keeping the black areas dense enough to block UV light during exposure processing. Positive FX is more dimensionally stable and allows more UV light to pass through compared to UVII. UVII offers more economy on a per sheet basis.